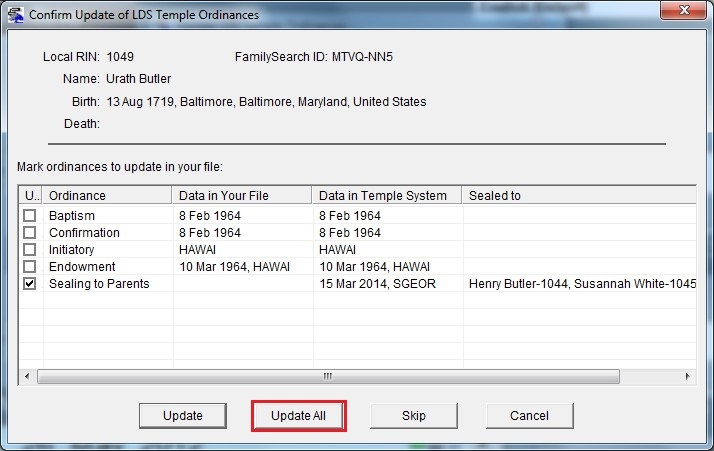 This applies only to those with an LDS Login to FamilySearch Family Tree. Others will receive the message invalid_grant error during login to FamilySearch: 400. 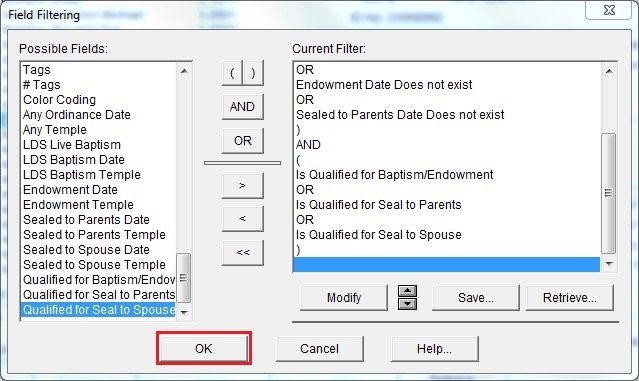 The purpose of this function is to update ordinance information in the local AQ or PAF file, so that it reflects new ordinance activity in Family Tree. 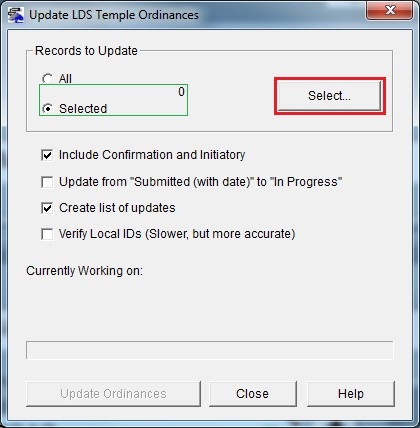 Select the Update Ordinances option. 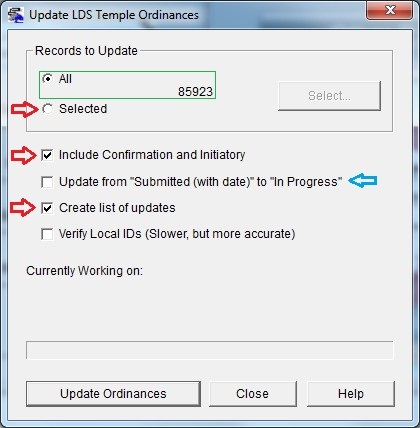 This is the Update LDS Temple Ordinances screen. Use the Records to Update box at the top to select which records you want to test for update. This shows that All has been selected, and reports the number of records to be tested. There are four check boxes in the section below the Records to Update box. Check the first if you want to bring information about Confirmation and Initiatory ordinances into your file. The next box is used to place the words In Progress into the ordinance date for ordinances awaiting completion. I prefer to retain the date of submission. The third check box tells AQ to create a report of all changes made to your database during this process. I always select this option. 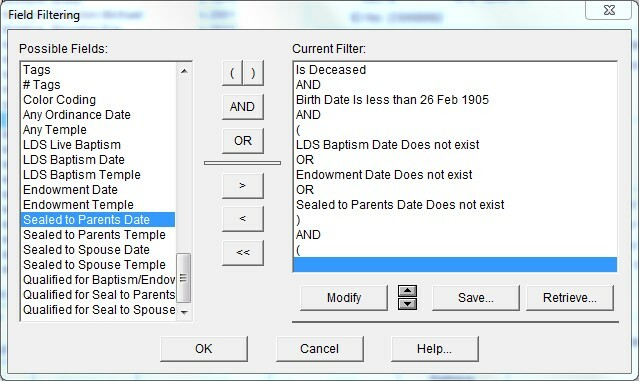 The last check box is used to let AQ know how to handle the situation where Family Tree records corresponding to records in your file have been merged, and their FS PID changed. When records are merged, a new record is created with a new FS PID. All ordinance activity for that person is now stored with that new FS PID. The acronym API means Application Program Interface. An API includes the rules by which information from one computer system are to be transferred to another. 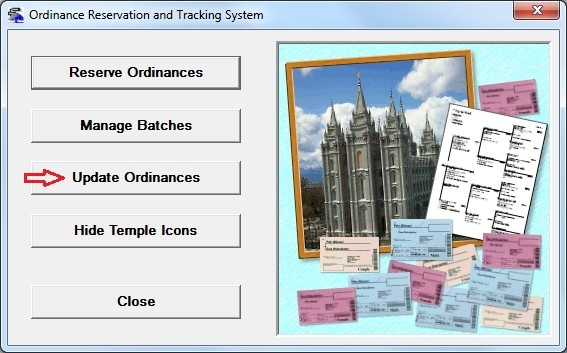 The LDS Church writes the API which governs access to their databases. 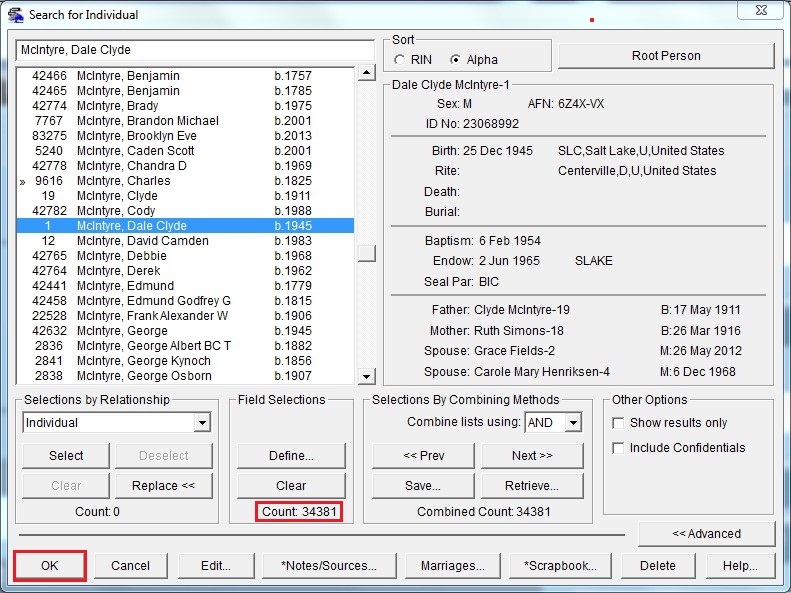 Under the API for the older nFS system, if a person on your file is linked to the Family Tree, and later is merged with another, a new record is created with a new FS PID, but your local file does not know about the new ID number. 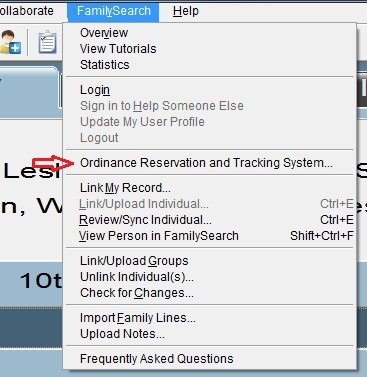 When you accessed ordinance information under that system, what was returned was the information as it was prior to the merge, for the record to which you were linked. Under the new FSFT API, if you attempt to access that information with the older FS PID, the church returns an error with no explanation as to why. The correct procedure is for AQ to first ask if the old FS PID has changed. 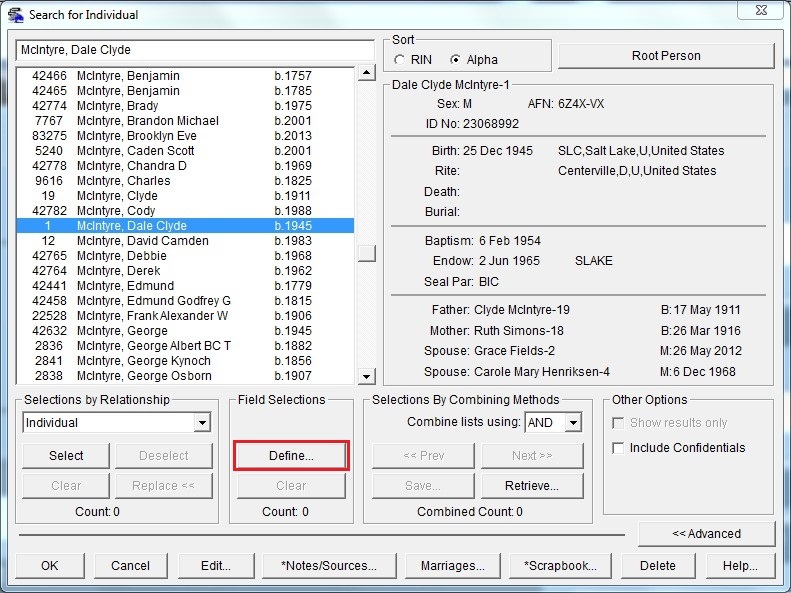 If it has, the church will return the new FS PID, and AQ will update that value in your file. AQ will then update any individual ordinance information which needs to be updated. If your record deals with a family, as most do, it is more complicated. Each family member must also be queried to see if their FS PID has changed. This about doubles the time required to process each member of the family. 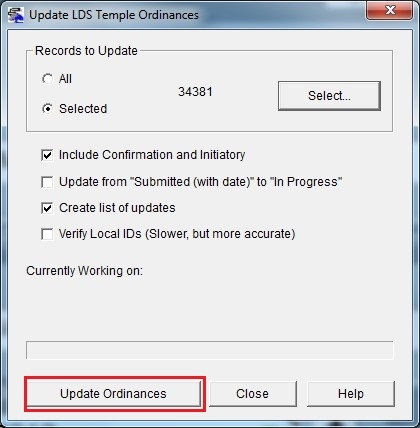 If you run the Update Ordinances procedure once a month or less often, there is a fairly high probability that you are linked to an individual whose record has been merged with another, and you will not receive any new ordinance information for that person, if you have not checked the box. It is up to you to determine how often you will run this procedure with this box checked on your file. By clicking the Selected radio button, you will access the currently selected records from the focus filter. This is likely to have zero records selected. In any case, click the Select button. 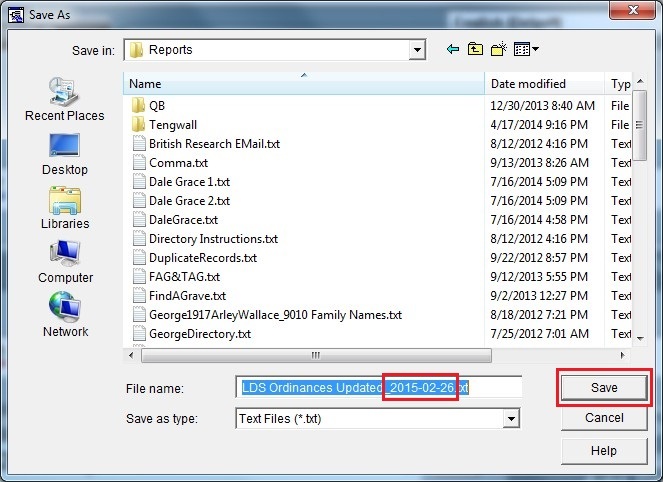 Here I will define a query which will reduce the number of records presented to the Update Ordinances function. I will click the Define button. …I want them to be qualified for at least one ordinance. I could click Save, and give a name to this query, and then I could retrieve it for use again at some later date. In this case I will just click OK.
AQ determines how many records meet those specifications, and I click OK. 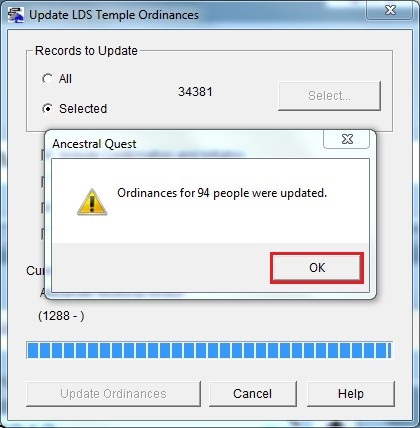 I am ready to continue, so I click on Update Ordinances. AQ finds the first record with a change in an ordinance, and reports it to me. 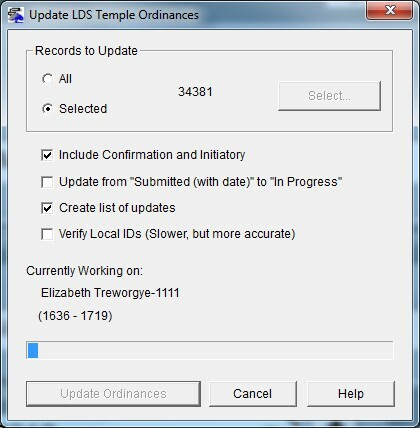 I have the option of skipping the update, updating this record only, or updating all records which have updateable information about ordinances. I choose to Update All. I alter the name of the report to include the date in YYYY-MM-DD format so that I can see a history of my updates in chronological order, and I click Save. …and presents me with a log of the before and after values for fields that were changed. Suggestions/Questions about AQ Will Do or Subjects discussed here? Leave a Comment Below. I would like to hear from you! Enter your email address to follow AQWillDo and receive notifications of new posts by email.